In pastures with a high proportion of native perennial grasses, when minimum ground cover (80%) and herbage mass (800 kg DM/ha) trigger points are in place, grazing intensity has little influence on pasture composition. High spring/summer rainfall can have a rapid and positive effect on the proportion of native grasses. Increasing grazing intensity can increase utilisation and growth such that stocking rates can be increased on native pastures. The proportion of native grasses increased across all treatments from 27% to 70% in response to rest and late spring rains in the year prior to the experiment. There was no further increase of total native grass composition throughout the experiment. However, the basal cover of Microlaena significantly increased (4% to 8%) following a wet summer in 2010. This result was consistent with findings from the Chiltern Proof Site in northeast Victoria, where Microlaena increased from 10% to 30% of basal cover after two years of high summer rainfall. There were few significant differences in the composition change of native perennial grass species between grazing systems. Any differences were generally short-term or seasonal. Ground cover on average was higher in the 20-Paddock than the 1-Paddock and 4-Paddock systems, although the overall difference was small. The difference between systems was greatest in summer and autumn when there was a feed deficit (feed demand was greater than pasture growth). Flexible stocking rates prevented ground cover from degrading below the 80% target in any system. 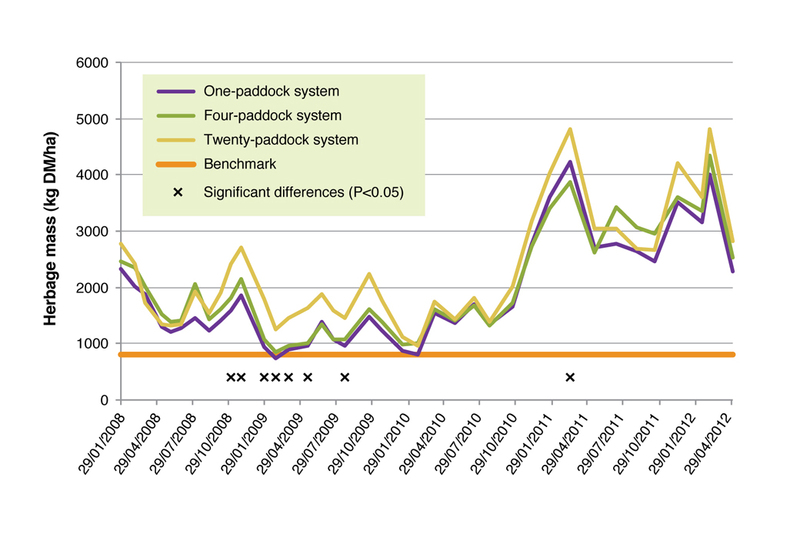 Standing herbage mass was greater in the 20-Paddock system than the 4-Paddock and 1-Paddock most of time from November 2008 to October 2009. 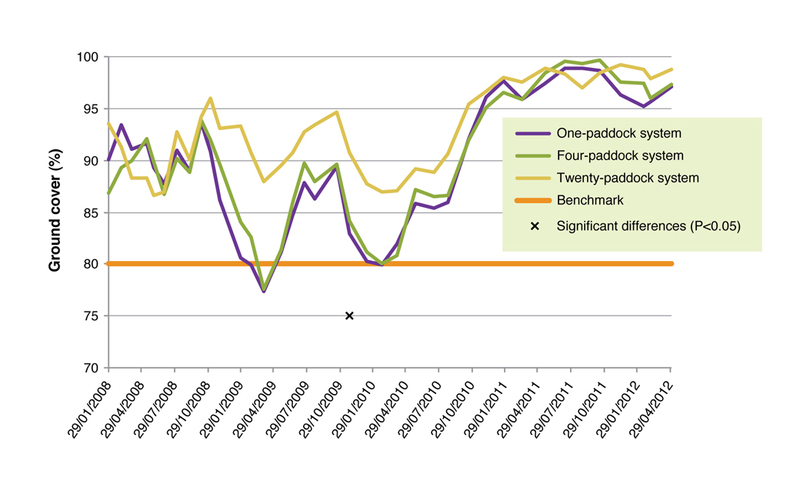 Stocking rate was increased in the 20-Paddock from February 2009 in response to the higher available herbage mass. 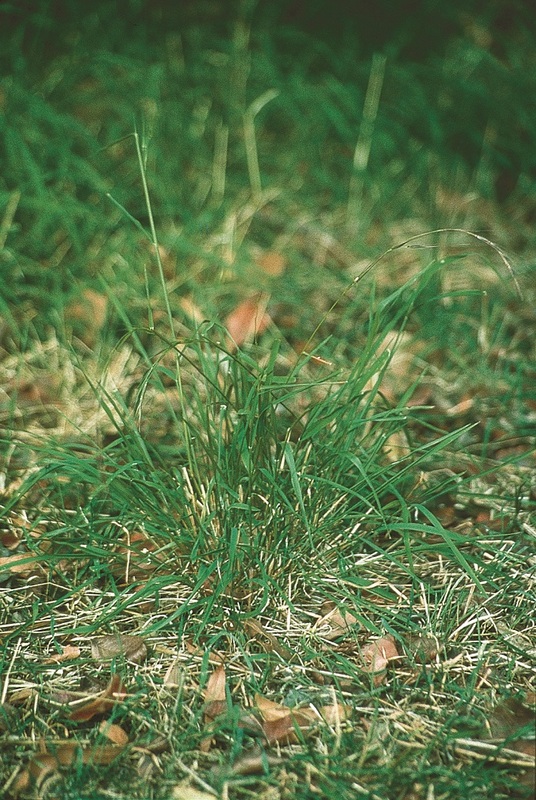 Annual ryegrass (Lolium rigidum) is a species that provides high quality forage in native pastures during late winter when green feed is most limiting. The contribution of annual ryegrass was particularly important at Panuara because of the dominance of native and naturalised perennial grasses (>80% of the pasture composition). There was greater herbage mass of annual ryegrass in the 20-Paddock than the 1-Paddock each spring. Less annual ryegrass in the 1-Paddock was probably due to the increased selective grazing in this system. Minimum herbage mass (800 kg DM/ha) and ground cover (80%) targets were in place to prevent degradation and this is likely to have limited compositional change between systems. It is worth noting that although compositional differences between treatments was not evident in the three years of this study, the systems needed to be run over a longer period of time to determine whether there are cumulative effects of management on nutrient cycling, and to for plants to respond to management over a greater range of seasonal conditions. In the Central Tablelands of NSW, a high proportion of grazing land is dominated by native pastures. Increasing returns from these pastures is therefore a priority for many farmers in the region. In a native pasture, the production potential, both in terms of growth and pasture quality, will largely be determined by the composition of annual and perennial species. It appears the composition of native pastures can be managed by controlling the timing and intensity of grazing and rest – preventing the frequent selective grazing of desirable species (enabling them to increase in size and have seedling recruitment), while ensuring there is competition against the less desirable species. Management strategies for native pastures, and the desired outcome, will depend on the initial pasture composition (proportion of different species). Where the aim is to increase the abundance of native perennials, resting at strategic times of the plant reproductive cycle may be needed. Where a high proportion of desirable perennials already exist, the aim is to manage for increased pasture quality and productivity through grazing and attention to soil fertility. From 2008-2012, EverGraze research sites at Orange and Holbrook in NSW and Chiltern in Victoria investigated the productivity and change in composition of fertilised native pastures under a range of management regimes. 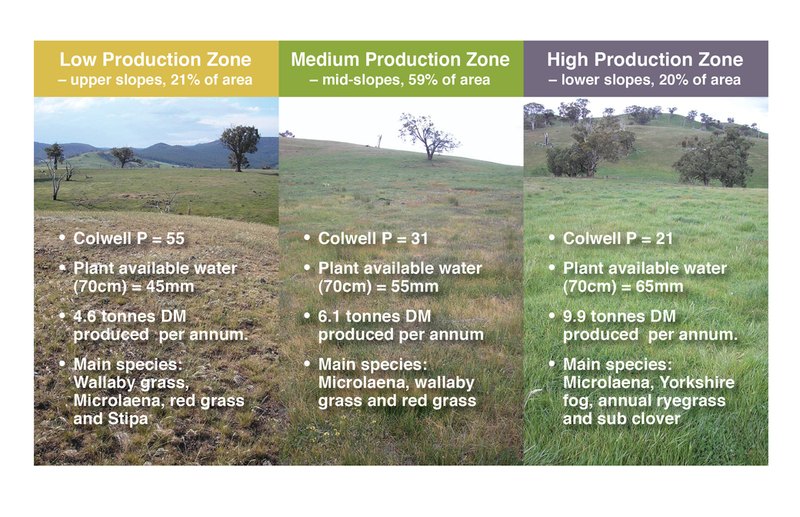 This page describes the pasture composition outcomes from the Orange site where native pastures were classified into three production zones and managed with three grazing system intensities – 1-Paddock, 4-Paddock and 20-Paddock rotations. Reference is also made to the findings from Chiltern and Holbrook. Identification and mapping production zones. This allowed targeted application of phosphorus fertiliser only to the proportion of land that would be most responsive. Applying minimum feed on offer (800 kg DM/ha) and ground cover (80%) benchmarks. Testing the value of higher intensity grazing systems to further increase production through improved utilisation while maintaining pasture composition. Utilising fertilised native pastures with a high value dual-purpose Merino enterprise. 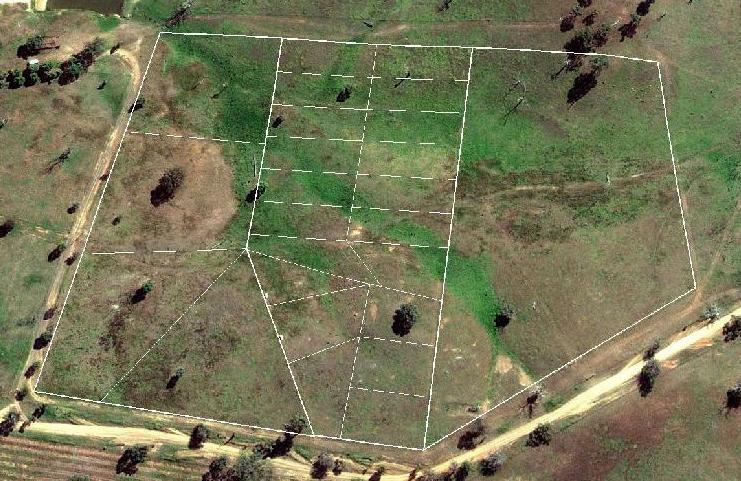 1-Paddock – animals grazed the entire plot continuously, until benchmark targets were reached. 4-Paddock – sheep were moved between four equally sized paddocks. The time left in each paddock was based on the available feed in relation to the animal requirements and the stage of pasture growth. When animal requirements were higher (e.g. lambing and lactation), animals were moved sooner (i.e. pastures were not grazed as heavily). This normally coincided with high pasture growth rates in spring. Sheep were moved into the most suitable paddock determined by feed on offer, rather than following a set paddock order. 20-Paddock – sheep were moved between 20 paddocks. As with the 4-Paddock system, movements were based on available feed in relation to the animal requirements, pasture growth rate and stage of plant growth. More productive paddocks were grazed for longer or more frequently. The grazing period generally ranged from one to seven days, averaging four days and with rest periods from 30 to 140 days, averaging 70 days. Paddocks were rotated more quickly when pasture was actively growing in spring, which coincided with higher animal requirements. 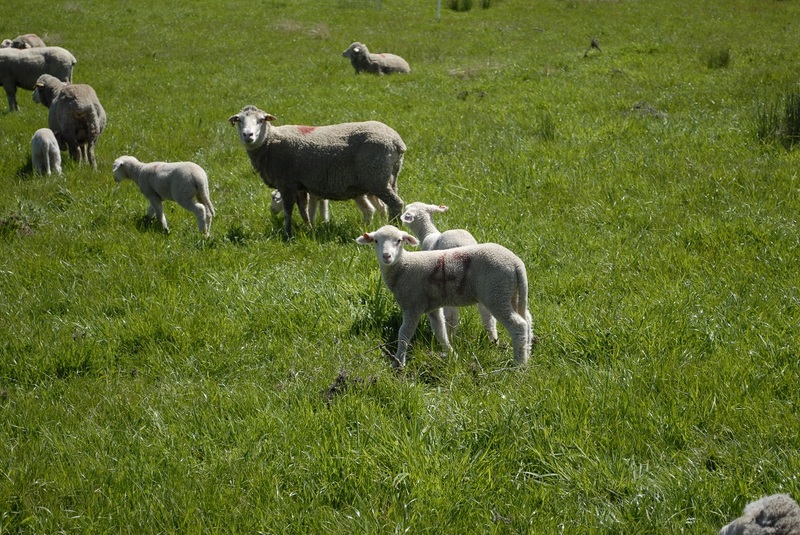 Paddocks were generally grazed in the same order, but were sometimes omitted or grazed out-of-order if there was insufficient pasture quality and feed on offer for the animal requirements, to avoid seed contamination of lambs, or to maintain ground cover on ridgelines. Like most native pastures in the Central Tablelands, the Panuara site is undulating and highly variable in aspect, slope, and soil type and depth. The altitude ranges from 770 to 820 m above sea level. There are large differences in the capacity for pasture production due to topography. Therefore, before the experiment began the site was classified and mapped into three production zones (Figure 1) by visually estimating green herbage in spring. Figure 1. Production zones at Orange Proof Site, Panuara. The production zones were used to determine where grazing system replicates and plots were located. All plots within a replicate were estimated to have a similar proportion of High, Medium and Low Production Zones so they all had the same potential productivity (Figure 2). Phosphorous fertiliser (Single Superphosphate) was applied only to the High Production Zone at 250 kg/ha in 2009 and 125 kg/ha in 2010 which maintained fertility levels. With no fertiliser inputs, the low production and medium production zones declined in their phosphorous levels, from 54 to 41 mg/kg and 31 to 23 mg/kg respectively. The Orange Proof Site research message Landscape variability can be identified, mapped and managed provides further detail on the benefits of mapping to production zone. To understand the changes in pasture composition and pasture growth, pastures were visually assessed at four to six week intervals for total herbage mass, green and dead, litter, plant composition and percentage ground cover using BOTANAL techniques (Tothill et al. 1992) in 60 quadrats (0.1 m2) at fixed locations within each plot. Ten quadrats cut to ground level were used to calibrate visual estimates. Basal frequency is a measure of persistence of perennial grasses whereby the number of tiller-bases are counted under fixed grid points and change is monitored through time. Measurements were collected at 54 fixed points every autumn. Nine points were taken at the intersection of 10 x 10 cm grid, within a 0.1 quadrat at each monitoring point. The rainfall was variable over the experimental period; it was slightly below average in 2008 and 2011, much below average in 2009 and much above average in 2010 (Figure 3). Both 2008 and 2009 were dry through autumn, while 2009 and 2011 were dry in spring. The dry spring in 2009 was also accompanied by very high temperatures during November and this caused a feed deficit at this time. Figure 3. 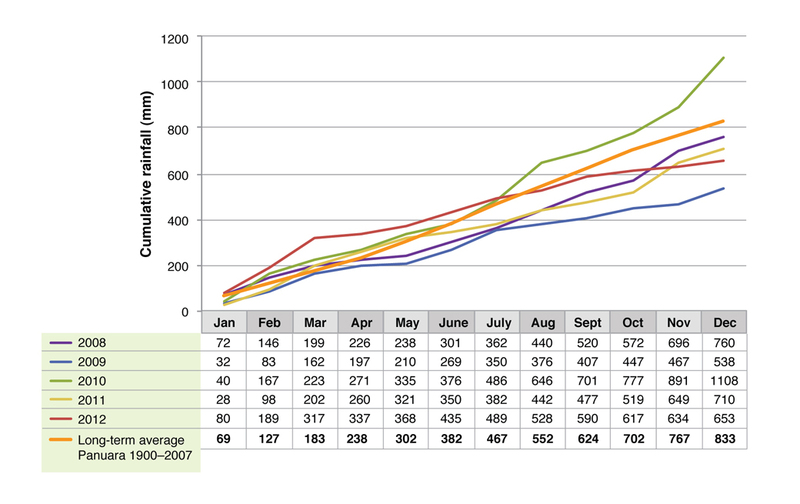 Monthly cumulative rainfall at the Panuara site from 2008 to 2012. 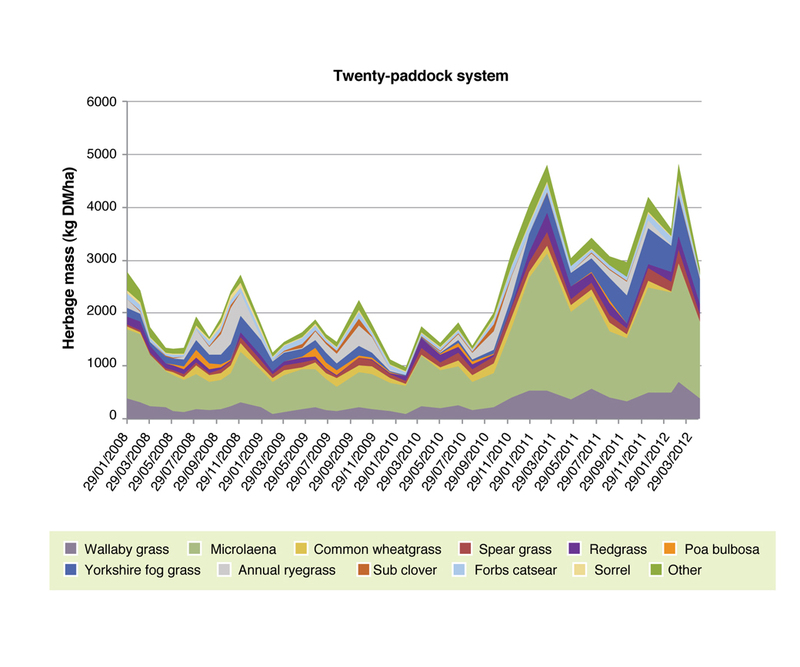 Standing herbage mass was greater in the 20-Paddock than the 4-Paddock and 1-Paddock systems most of time from November 2008 to October 2009 (Figure 4). Stocking rate was maintained at higher levels in the 20-Paddock system from February 2009 in response to the greater availability of feed (see Orange Proof Site message The effect of grazing intensity on production and profit from native pastures). There was a large increase in the herbage mass on each plot from late 2010 in response to above average rainfall, mainly through summer. The additional herbage mass in the 20-Paddock system was due to more efficient utilisation and at times additional pasture growth compared to the 1-Paddock system. The resting of pasture removed selective grazing and allowed the accumulation of annual rye grass. 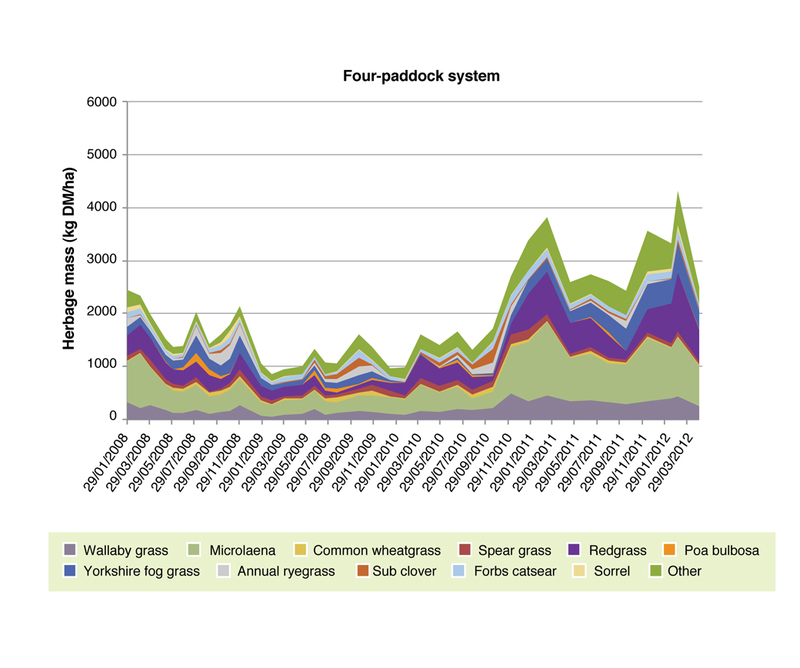 Figure 4: Herbage mass for 1-Paddock, 4-Paddock and 20-Paddock treatments. The minimum herbage mass benchmark of 800 kg DM/ha and significant differences (P<0.05) are displayed. A minimum 80% ground cover benchmark was chosen for the Panuara site (rather than the standard 70% recommendation for the high rainfall zone) as this is needed to prevent erosion in the steeper landscapes. Flexible stocking rates prevented ground cover from degrading much below the 80% target in any system, but there were two occasions when ground cover in the 1-Paddock and 4-Paddock systems met or fell below the 80% benchmark – during the summer and autumn periods of 2009 and 2010 (Figure 5). In these periods of deficit the 20-Paddock had higher levels than the other systems, remaining well above the benchmark at around 88%. On average, the 20-Paddock system had higher ground cover levels (92%) compared to the 1 and 4-Paddock systems (90%), although the differences were small. Figure 5: Ground cover for 1-Paddock, 4-Paddock and 20-Paddock treatments. The minimum ground cover benchmark of 80% and significant differences (P<0.05) are displayed. At the beginning of the experiment in September 2007, the average composition for the site was 27% native perennial grass, 30% annual grass, 7% legume, 11% other perennial grasses and 25% broadleaf plants and minor species. Grazing was removed from the site at this time until the experiment began on the 1st February 2008. Over this period there was a dry spring, which caused the annual grasses to dry off early, and this was followed by above average rainfall from November 2007 to February 2008. The rain and rest resulted in a shift in pasture composition. Measured composition the following spring was 54% native perennial grasses, 16% annual grasses, 3% legume and 11% naturalised perennial grasses (eg. fog grass). This dominance by native perennial grasses was then maintained throughout the experiment. There were few consistent differences in pasture composition between grazing systems (Figures 6, 7 and 8). 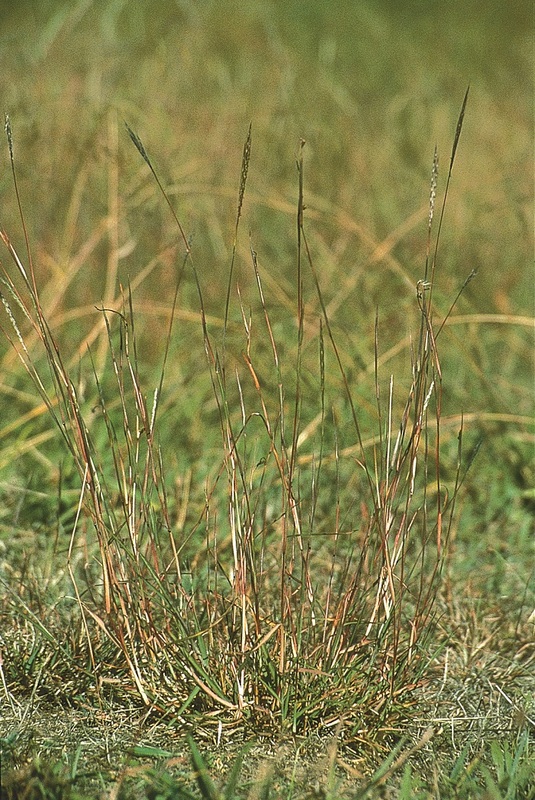 Grazing system had no influence on wallaby grass (Rytidosperma spp. formally Austrodanthonia spp. 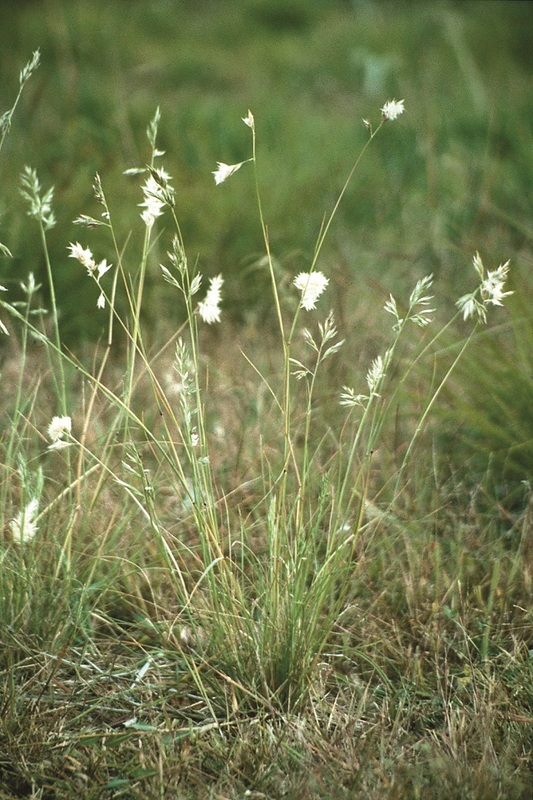 ), speargrass (Austrostipa spp. ), Yorkshire fog (Holcus lanatus), catsear (Hypochaeris radicata) or sorrel (Acetosella vulgaris). Microlaena (Microlaena stipoides) was initially greater in the 20-Paddock than the 4-Paddock and 1-Paddock systems (1313 versus 835 kg DM/ha). This difference was found again regularly from January 2009 throughout the experiment, but from May 2011, differences were generally only between the 20-Paddock and 4-Paddock systems. Redgrass (Bothriochloa macra) was higher in the 4-Paddock than the 20-Paddock in June and November 2008, and in January 2010. There was more annual ryegrass (Lolium rigidum) in the 20-Paddock than the 1-Paddock each spring (Figure 9). This is likely due to a lower degree of selective grazing of this species which has high feed value. Sub clover (Trifolium subterraneum) was higher in the 1-Paddock system in August 2008, but not at any other time. While many of these species represent only a small proportion of the pasture composition, the annual grass, sub clover and forbs in particular can add valuable forage quality through the winter period. While the composition was monitored for different production zones, there were no trends between grazing management and production zone, and so this data has not been presented. 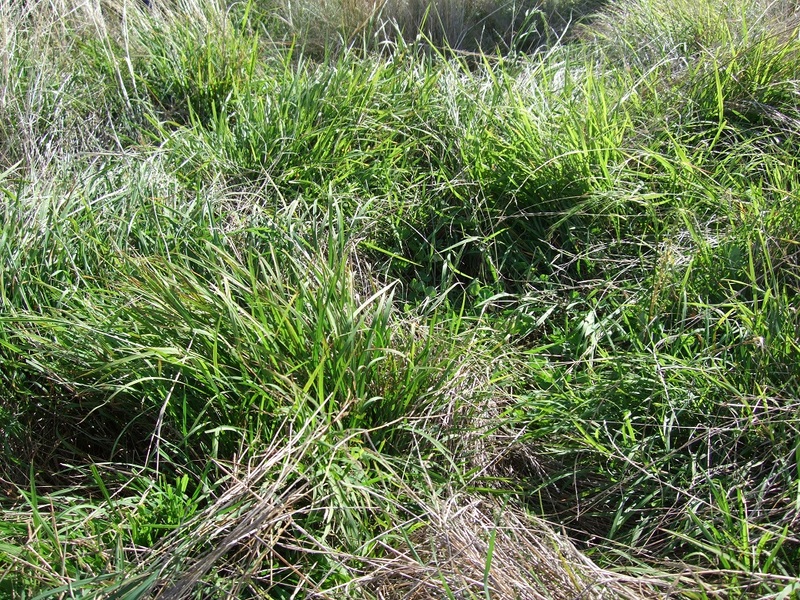 Figure 9: Herbage mass of annual ryegrass (kg DM/ha) between grazing systems. The 20-Paddock system had a higher annual ryegrass herbage mass in spring, compared to the 4-Paddock and 1-Paddock systems. 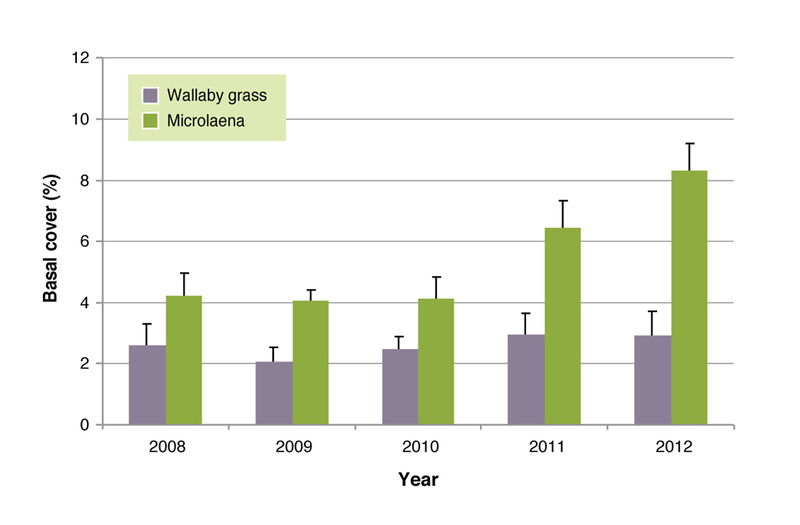 Basal frequency of the two main perennial grass species, wallaby grass and Microlaena, did not vary due to grazing treatment throughout the experiment. However, there were seasonal changes in basal frequency for Microlaena (Figure 10), which increased in 2011 and 2012 in response to above average rainfall during the previous two summer periods. Wallaby grass did not respond in the same way. The difference between the two species could be due to the ability of Microlaena to reproduce vegetatively, while Wallaby grass only reproduces from seed. Also Wallaby grass is found at higher proportions in the LPZ, which is generally drier possibly reducing the chance of recruitment. This result demonstrated that grazing system had no influence on perennial plant cover, but seasonal differences were more common. 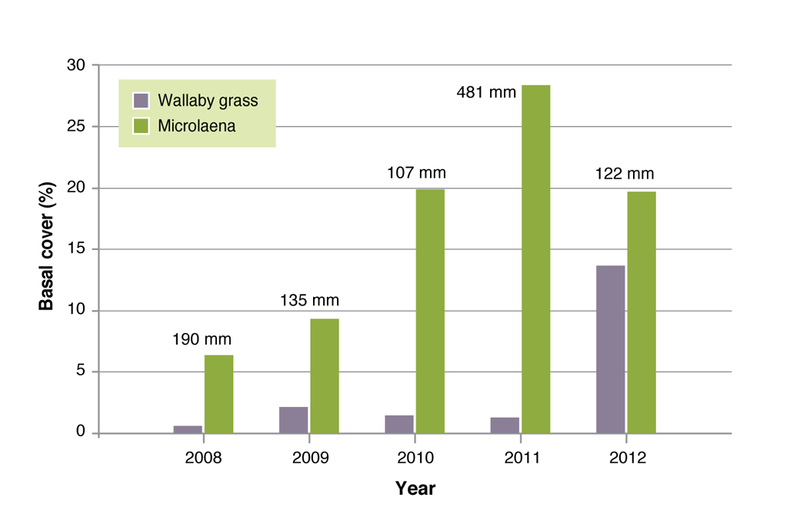 Figure 10: Average basal frequency of Microlaena and wallaby grass averaged over all treatments. Error bars indicate differences between years. Simultaneous to the experiment at Panuara, a 4-paddock rotation was compared to set stocking at Chiltern in Victoria. The same ground cover and herbage mass thresholds were applied in the Chiltern experiment as were applied at Panuara. Soil phosphorus levels at the site were very low at the beginning of the experiment, and two fertiliser rates (Single Superphosphate) were compared (250 kg/ha/year and 125 kg/ha every second year). Two stocking rates (high and low) were also compared. Like Panuara, at the beginning of the experiment there was a high proportion of perennial grasses which made up between 40% and 80% of pasture composition. During the three years of the experiment at Chiltern, and while thresholds for destocking based on ground cover (80%) and herbage mass (800 kg/ha) were in place, there were no pasture composition differences between grazing treatments (simple 4-paddock versus set stocking) or stocking rate (low and high). This is consistent with the Panuara results. In contrast to expectations, there was no increase in the annual grass or clover composition or decrease in native grass composition in response to phosphorus fertiliser inputs. This was most likely a result of the high initial native grass composition and low proportion of fertiliser-responsive annual grasses and broadleaf weeds (the dominant annual grass was sweet vernal grass). The average Microlaena basal cover (over all treatments) increased steadily from 7% (2008) to 28% (2011) during the experiment (Figure 11). This was most likely due to spread of existing plants in response to managing to herbage mass and ground cover benchmarks, and high summer rainfall in 2010. Wallaby grass basal cover dramatically increased (from around 2% to 14%) in the fourth year, most likely due to recruitment of new plants in response to summer rainfall events in 2010 and 2011 combined with a reduced 2011-12 summer stocking rate. Figure 11. Basal cover (%) for weeping grass and wallaby grass, annually for the period of the Chiltern EverGraze Proof Site experiment. Figures above the bars represent summer (December, January and February) rainfall (mm). Photo 5. Microlaena increased basal cover by spreading with rhizomes after years with high summer rainfall at Chiltern and Orange. There has been much evidence of grazing management maintaining and enhancing perennial grasses in sown pastures (eg. Broadford Grazing Experiment). However, native grasses may be more resilient and less prone to change unless grazing pressure is high enough to reduce plant density. The three years results at the Panuara and Chiltern experiments indicated that pastures which have a high proportion of Microlaena and wallaby grass are resilient to moderate-high grazing pressure and invasion of annual species. The stable composition was also likely a result of the minimum herbage mass, (800kg DM/ha) and ground cover (80%) targets used in the experiments, which prevented the degradation of the pasture under all grazing systems. Therefore, for the purposes of maintaining perenniality of pastures with a high proportion of native grasses, paddock sub-division and rotational grazing may not be required if grazing is managed according to these benchmarks. Putting this into practice involves close monitoring of pastures and use of fodder budgets to plan ahead. The EverGraze FOO gallery for native pastures and EverGraze Feedbase Planning and Budgeting Tools are helpful tools for monitoring and planning ahead with seasonal fodder budgets. It is also necessary to have designated sacrifice paddocks or stock containment areas for when these benchmarks are reached. Although grazing system and the number of paddocks had little effect on composition at Panuara, the experiment showed that increasing the number of paddocks and fencing to production zone can increase control over the grazing system such that areas with less herbage mass can be rested while areas with more herbage mass can continue to be grazed. The 20-Paddock system also increased overall herbage mass, particularly of annual ryegrass which can have high feed value. These factors combine to increase pasture utilisation, stocking rates, and resulting gross margins, even though individual animal performance (lamb turnoff weights) is generally lower (see Orange Proof Site message: The effect of grazing intensity on production and profit from native pastures). Having more paddocks also makes fodder budgeting easier when pasture is limiting. Pastures that have a lower perennial density are likely to be less stable and more prone to shifts in composition caused by seasonal conditions and management. To increase the proportion of desirable species, periods of grazing and rest have to coincide with the right seasonal conditions and management according to the phenology of the species. Therefore, to provide an advantage to a desirable species over an undesirable species the lifecycle of both species must be known. A first step is to identify your native grass species. A poster and EverGraze fact sheets on native pasture identification are available for Victoria and the Bundarra and Eastern Namoi regions of NSW. Heavy grazing should target the undesirable species when they are most vulnerable (setting seed or germinating), and rest should target the desirable species in the same stage. This technique is well defined for the undesirable species wiregrass (Aristida ramosa) and the better native wallaby grass (Rytidosperma spp.) (Lodge et al.). Heavy grazing of undesirable annual grasses such as Vulpia in early-mid spring to reduce biomass production and seed set, and then resting to allow later flowering native grasses such as Microlaena and wallaby grass to increase biomass and set seed, has also been shown to be effective (see EverGraze Action – Management of native pastures in Victoria for details of this technique). The results from both Panuara and Chiltern showed that native pasture composition can be influenced significantly by rainfall. At Panuara, the greatest effect was achieved in the first year when annual grasses were suppressed, following a period of high late spring/summer rainfall and the removal of grazing. The Microlaena ecology study at Chiltern indicated that increases in Microlaena basal cover (observed at both sites) following summer rainfall in 2010 was unlikely to have occurred as a result of seedling recruitment, but rather by spread of rhizomes. The significant increase in wallaby grass at Chiltern was in response to summer rainfall combined with reduced stocking rates. In contrast to Microlaena, wallaby grass increases by seedling recruitment which means that it must be allowed to set seed and then be provided with spaces to germinate in the following autumn. In a previous five year study (Dowling et al., 2005) of high intensity short duration grazing at five locations in the High Rainfall Zone (HRZ) any composition change found between conventional grazing and high intensity short duration grazing, returned to be the same level by the end of the five year study. The lack of change was attributed to pasture rest not matching phenology and good seasonal conditions. It can often take several years of the favourable seasonal conditions and the correct management for change to appear. In a previous national grazing management study (Kemp et al., 2000) wallaby grass did not respond to any grazing management, while Microlaena only responded to higher grazing pressure in spring followed by a summer rest. Increasing the number of paddocks and fencing to production zone is unlikely to affect species composition in pastures with an existing high proportion of desirable native perennials, provided minimum herbage mass and ground cover rules (i.e. >80% ground cover and minimum 800 kg DM/ha) are applied to prevent degradation. Grazing management may be more effective at improving pasture composition in pastures with a lower perennial density or with a higher grazing pressure. Although grazing system was not shown to have an effect on species composition in this experiment, increasing the number of paddocks and fencing to production zone can reduce selective grazing and increase production of desirable species, pasture utilisation, stocking rates and resulting gross margins. When combined with management of stocking rates to enable native grasses to set seed, high rainfall in late spring/summer can have a significant and rapid positive effect on the proportion of native perennial grasses in a native pasture sward. It is worth noting that although compositional differences between treatments was not evident in the three years of this study, the systems needed to be run over a longer period of time to determine whether there are cumulative effects of management on nutrient cycling, and to allow a greater range of seasonal conditions for plants to respond to management. EverGraze is a Future Farm Industries CRC research and delivery partnership. The Orange Proof Site Team was led by Dr Warwick Badgery and consisted of scientists and technical staff at the NSW Department of Primary Industries and Charles Sturt University. An enthusiastic Regional Advisory Group consisting of farmers, consultants, extension officers and Catchment Management Authority staff also provided significant input into the direction, management and interpretation of outcomes to make them relevant to farmers. Dowling PM, Kemp DR, Ball PD, Langford CM, Michalk DL, Millar GD, Simpson PC, Thompson RP (2005) Effect of continuous and time-control grazing on grassland components in south-eastern Australia. Australian Journal of Experimental Agriculture 45(4), 369-382. Kemp DR, Michalk DL, Virgona JM (2000) Towards more sustainable pastures: lessons learnt. Australian Journal of Experimental Agriculture 40(2), 343-356. Lodge GM, Gogel BJ, Cullis BR, Archer KA (1999) Effects of grazing, slashing and burning on Aristida ramosa and sheep productivity in northern New South Wales. Australian Journal of Experimental Agriculture 39(6), 685-698.